This all-time favourite has been around for more than a couple generations now. Give the tiny wheel a spin to find out what big thing is going to be happening next in your "life": will you become a millionaire, go to jail, get a raise, tie the knot, go bankrupt or extend your family with yet another baby? Anything is possible. Yep, just like in the real world - and that's exactly why this game is so much fun. Another one that is every bit as popular as the Game of Life, and for good reason. Monopoly will never go out of style, because (let's face it) everybody loves to become a millionaire - even if it's only with pretend money. 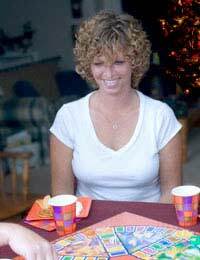 It is however best to avoid this game when there's an undercurrent of financial trouble or jealousy running through your group - in that case what starts as a friendly game of Monopoly could trigger intense emotions of a kind you want to avoid at Christmas. The butler did it! If only things were that simple…To avoid all confusion: yes, "Clue" is "Cluedo" - different name, same game. And it is of course the one where you get to play detective and figure out who committed that heinous crime… So put on your Sherlock Holmes hat, curl your moustache into a "Poirot" and break out the magnifying glass, because every little hint matters. Who is the smartest and most attentive crime-solver in the room? Cranium is absolutely perfect for people who get bored easily: instead of playing one game, you get to play fourteen! Drawing with your eyes closed, humming songs, answering trivia questions, spelling words backwards: it's all in there - and then some! A game of Cranium could go on for a very long time, so make sure there's enough wood in the fireplace, brew another pot of coffee and put on some nice background music: you're in for hours of fun! Where was Pope John Paul II born? Is an "oud" a musical instrument, a bird, a tool to change tires with or a kitchen appliance? What's Madonna's real name? How many Oscars has Francis Ford Coppola won so far? You'll absolutely adore a game of Trivial Pursuit. Winning doesn't even matter: the fun is in the - often beautifully random - questions. Oh, and the answers are Poland, musical instrument, Madonna Louise Ciccone and none. Give everyone a piece of paper and a pen. Ask them to write the name of a famous person on the paper or the name of a person everyone around the table knows. Then fold the paper up and tell everyone to do the same and put them all into a bowl and give it a shake. Ask everyone to pick one from the bowl and not to open it. Then take it in turns around the table to hold the piece of paper to your forehead so that you can't see what name is written on it but everyone else around the table can. A game of fun for everyone to play and really funny when your Grandma is trying to guess she's Pamela Anderson!